Using just the power of steam, your home will be clean and bacteria free with a diamond sparkle in no time just using the power of steam! 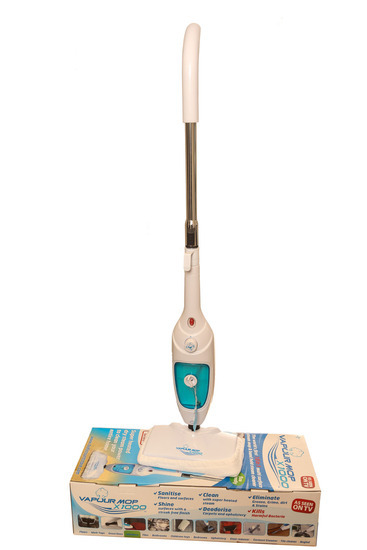 Simply fill with water and in under 10 seconds you are ready to clean with the power of steam! Its ergonomic design moves effortlessly around your home while the specially designed triangle shaped head easily cleans right into corners. The super heated steam penetrates deep into grout lines removing even the toughest of stains and the super absorbent microfiber pad picks them up - leaving your floors sparkling clean and touch dry in seconds. Plus the microfiber pads are washable and reusable. Attach the carpet glider and you can refresh and revive your carpets and rugs. 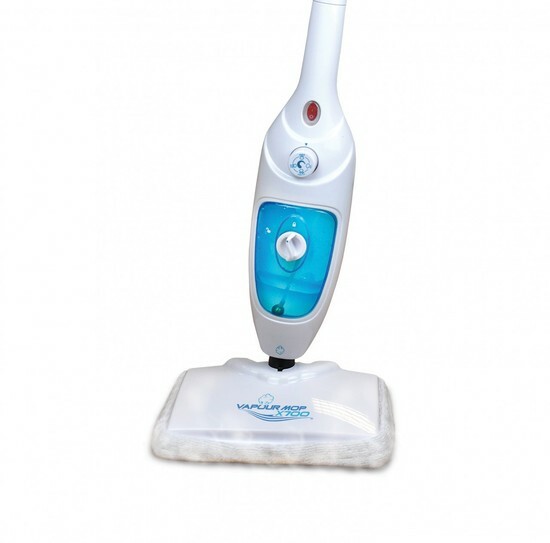 Here is an exert from a recent review..
"...my Vapour Mop is fabulous, does what it says, made my oven like new, it cleans around my spa bath and it saves you money and time by not having to use other products with it. It's great for cleaning the microwave and also in the bathroom under the toilet rim!! I love it, and it makes housework enjoyable." excellent product for the price. recomend it. This mop is Perfect ,great value for money and cheaper then advertised, easy to handle no leaks or spills.well worth Purchasing. I've only had this cleaner a few days and started using it four days ago. At the moment I am tackling our hall carpet which was quite heavily soiled in places and is now looking a lot better after a couple of sessions. I am confident that the cleaner will be an invaluable piece of equipment in the future and would certainly recommend it at the price I paid. This product is well worth the money, it does everything as per the specification stated in the system. I find the items that I have purchased most reliable. The Vapour Mop was no exception. A very worthwhile purchase. Well, I read other reviews first and to be honest, did wonder what all the fuss was about. Now that I have, I completely understand. This is a wonderful piece of kit - tiled floors, wood flooring and rugs - fabulously clean, in half the time that the mop and bucket takes, leaving no streaking or wet patches. Don't waste time thinking about it - buy one! first class product, first class delivery which is the norm for Morgans, will certainly recommend. Seems a jolly good product - worked well the very first time we tried it! Should be very useful. Excellent purchase, between my wife and I, we have used most of the accessories with brilliant results. very good price (apart from delivery charges!) and product comes with lots of useful tools and add-ons. As good a product as others (Shark, H2O) that can cost a lot more. Reliability and durability always issues with steamers (they tend to leak after a while) so see how robust this unit is. 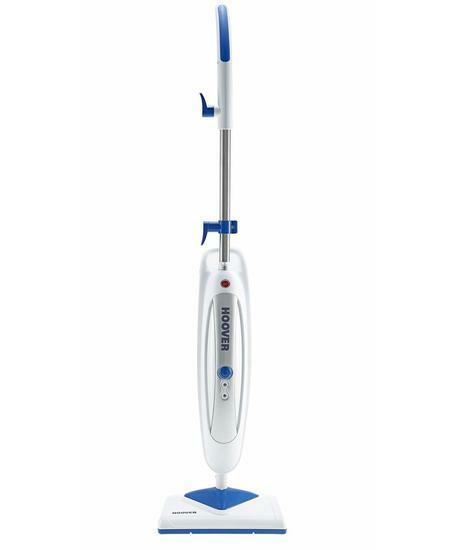 Bought this to replace a Ewbank useless steamer and straight away I was impressed by the quality of the Vapour Mop X1000. It instills confidence from the start. Great steam cleaner that I highly recommend. We missed out on a black Friday bargain and so bought this steam mop instead. It all works really well and removes lots of dirt that otherwise couldn't be removed. I think my wife is developing OCD as she keeps finds new things to clean around the house. She is currently steam cleaning the stone surround on the fire grate. Brilliant cleaning-does what it says it does,and is cheaper than most advertised, Very good value. This is a very good steamer....I already have two different steam cleaners but this one is far superior, having a huge range of useful accessories. I find that the best feature is the setting which allows an increased flow of steam, which is particularly good for use on carpets. You can now recycle your old electricals with us. If you are buying a new electrical item, we will recycle your old one for free. Read more about our recycling programme. This site copyright © Bentham Ltd 2019 | All prices exclude VAT unless stated otherwise.